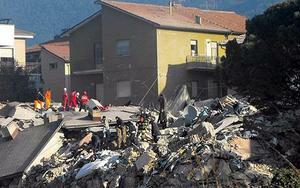 Six of Italy’s top seismologists are being investigated for manslaughter for not warning the city of L’Aquila about an earthquake that struck on 6 April 2009. The magnitude-6.3 earthquake caused 308 deaths and 1,600 injuries, and left more than 65,000 people homeless. The L’Aquila public prosecutor’s office issued the indictments on 3 June, a step that usually precedes a request for a court trial. The investigation originated when about thirty L’Aquila citizens registered an official complaint that the scientists had failed to recognize the danger of the earthquake during the days and weeks in advance. At a press conference after the meeting, government official Bernardo De Bernardinis, deputy technical head of the Civil Protection Agency, told reporters that “the scientific community tells us there is no danger, because there is an ongoing discharge of energy. The situation looks favorable.” In addition to the six scientists, De Bernardinis is also under investigation. Nosengo notes that minutes from the 31 March meeting show that the scientists recommended that buildings in the area should be monitored to assess their ability to handle a major shock. Although the scientists are unable to comment due to the investigation, one of the scientists, Enzo Boschi, president of the National Institute for Geophysics and Vulcanology (INGV) in Rome, wrote in a letter last September that the meeting was too short and that he had not been informed about the following press conference. Only one of the seismologists from the committee, Franco Barberi, a volcanologist at the University of Roma Tre, was at the press conference. Nosengo lists the six scientists and officials under investigation for manslaughter as Boschi; Barberi; Giulio Selvaggi, director of the National Earthquake Center based at INGV; Claudio Eva, a professor of earth physics at the University of Genoa; Mauro Dolce, head of the seismic risk office in the Civil Protection Agency; and Gian Michele Calvi, director of the European Centre for Training and Research in Earthquake Engineering in Pavia. Coming to the defense of the seismologists, nearly 4,000 scientists from around the world have signed a letter to Italy’s president, Giorgio Napolitano, urging him to focus on earthquake preparation rather than holding scientists responsible for something that they cannot do — predict earthquakes.